Hard chrome enjoys high significance as wear- and corrosionprotection coating due to its known and tested qualities. In our modern hard chrome plating plant, we can process workpieces up to a length of ~13 metres and a weight of ~25 tonnes. KANICHROM® is a widely know name for the successful combination of two coats with extraordinary properties: KANIGEN® and hard chrome. With KANIGEN® as barrier layer between base material and hard chrome, an optimum corrosion protection is combined with the known advantages of hard chrome plating. Ideal for repairs with true to size layer application! We process workpieces up to a length of ~13 metres and a diameter of ~1.4 metres with a total weight of up to ~25 tonnes. KANICHROM® is a double coat made of KANIGEN® and hard chrome. As amorphous barrier layer, KANIGEN® offers a perfect corrosion protection against a multitude of aggressive chemicals. The well-known qualities of hard chrome (hardness, wearresistance and sliding properties) are ideally combined with the features of KANIGEN®. 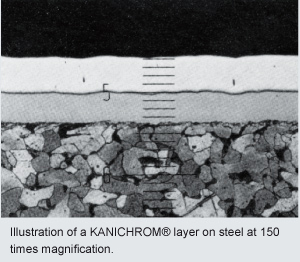 This coating combination prevents undercorrosion, as the enclosed KANIGEN® coating undertakes a block function below the micro-fissured chrome layer. The workpiece obtains surface qualities through KANICHROM® that is offered by no base material. As hard chrome is applied on the especially uniform KANIGEN® layer scarcely thicker than 20 μm, the otherwise well-known edge-forming effect of galvanised chrome is dispensed with. In the said combinations, KANICHROM® can be set up true to size in the narrowest tolerances without refinishing work. Hard chrome is an integral part of surface engineering. This traditional process offers excellent wear protection properties and corrosion protection with low adhesivity. We have advanced this technology for your benefit. Our hard chrome plating plant makes use of new generation technology.